At E3, it was legendary Metal Gear developer Hideo Kojima who took the stage to announce his oversight of the next Castlevania game, not the man long associated with the series. Today, series publisher Konami addressed that curiosity with Kotaku. Koji Igarashi, who has overseen three critically-lauded Nintendo DS Castlevanias and has been involved with the franchise since 1997's Castlevania: Symphony of the Night, is still with Konami, company spokesman Jay Boor told me during a phone call from the San Diego Comic-Con. "He is still at Konami, and he is still working on projects," Boor said. The spokesman said that press questions about Igarashi's status have been common since Igarashi failed to appear during the E3 debut of the Kojima-overseen Castlevania: Lords of Shadow. That new Castlevania game is being developed by Madrid-based MercurySteam with involvement from Kojima Productions. The new title was the first major Castlevania project announced without an apparent connection to Igarashi in years. Boor declined to address questions of Igarashi's potential involvement in Lords of Shadow, neither confirming or denying that the developer would be working on that project. Konami hopes to announce the next Igarashi project at the Tokyo Game Show. 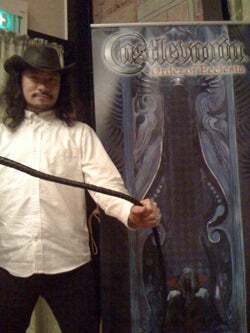 Castlevania games have been released in 2005, 2006 and 2008 on the DS, but no such project has yet been announced for 2009. Each of those games has been overseen and promoted by Igarashi. Asked by Kotaku if there would be a new DS Castlevania this year, Boor said, "I can't say anything." We'll look to TGS for the next chapter of this story, which will hopefully illuminate Koji Igarashi's path at Konami and whether there will be any further intersections with the storied Castlevania series.